Add chicken breasts, stock and garlic to skillet. Cook chicken in the stock over medium heat until cooked through and tender. Shred the chicken into the casserole dish (9×13), discarding any remaining stock. Dot the chicken/tomatoe mix with little bits of cream cheese. Cover with shredded pepperjack cheese. Cover with shredded monterey jack cheese. Cook in 350 degree oven for 35 minutes, until brown around the edges. Another great recipe I adapted from http://www.ruled.me.com. It makes 6 servings and contains 2.5 net carbs each. Preheat oven to 400F. Season chicken thighs well with salt and pepper. Bake chicken thighs in a casserole dish for 35-40 minutes (depending on size of thighs). Once your timer hits 20 minutes, start on the filling. Chop 6 slices of bacon into pieces and put into a pan over medium heat. Once bacon is mostly crisped, add jalapenos (chopped) into the pan. Once jalapenos are soft and cooked, add cream cheese, mayo and hot sauce to the pan. Mix together and season to taste. Remove chicken from the oven then spread cream cheese mixture on it, then top with cheddar and mozzarella cheese. Bake for 10-15 minutes at 400F. Broil for 3-5 minutes to finish. Optional: Top with extra jalapenos before you broil. Yum, yum! This is a great recipe my whole family loved from http://www.genaw.com. It makes 8 servings (unless you are my family and it makes 4-6 servings). Each serving has 3 net carbs. I will give the directions for chicken breasts and chicken thighs. I used chicken thighs. Season the chicken (salt, pepper and garlic powder). Brown in hot oil. Set aside. Brown the sausage and celery. Drain and cool slightly. Heat the oven to 350. Spray a 9×13″ baking pan and put the mushrooms in the bottom. In a bowl, mix the sausage, cream cheese, 4 ounces cheddar cheese and the parsley. Spoon this mixture over the mushrooms and smooth with a spoon. Place the chicken on top. Cover and bake 30 minutes. Remove the cover. Top with the rest of cheese. Bake 15 minutes until the cheese is melted and browned and the chicken is cooked. To serve, put the chicken on a plate cheese side up. Spoon the mushroom mixture over the top. Heat the oven to 425. Spray a 9×13″ baking pan and put the thighs in the pan. Season with salt, pepper and garlic powder. Bake, uncovered for 20 minutes. Remove chicken from pan and drain grease. Brown the sausage and celery, drain. Mix in the cream cheese, mushrooms and parsley. Spread in the bottom of the baking pan. Top with thighs. Bake another 30 minutes or so, uncovered, until the chicken is done. This is a great recipe from http://www.ruledme.com. This makes 4 servings and each serving has 4 net carbs. Grid up pork rinds, flax, parmesan cheese and spices in food processor. Slice chicken breasts in half or in thirds and pound them out into cutlets. In a separate container to the coating, crack an egg and whisk with 1-1/2 tsp. chicken broth. In a saucepan, combine all ingredients for the sauce and whisk together. Let this cook for at least 20 minutes while you are making the chicken. Bread all chicken cutlets by dipping into egg mixture, then dipping into the coating mixture. Set aside on a piece of foil. Heat 2 tbsp. olive oil in a pan and fry up each piece of chicken 2 at a time. Add more oil as needed. Set pieces of chicken into a casserole dish, add sauce on top and then sprinkle with 1 cup of mozzarella cheese. Bake at 400F for 10 minutes or until cheese is nice and melted. This is a yummy recipe I adapted from lowcarbfamily.com. The recipe states it serves 8 and has 3 net carbs per serving. STEAM broccoli in the microwave 2-3 minutes. If you like the broccoli crunchy, skip this step. PREHEAT oven to 350 degrees. Spray a 9×13 pan with non-stick spray. Place chicken and broccoli in a large mixing bowl. Saute onion in olive oil with salt and pepper. When onion is soft and slightly brown (about 3-5 minutes), add cream cheese to saute pan. When cream cheese is melted, whisk in chicken broth until the mixture is smooth. Allow to simmer for about a minute, or until sauce thickens slightly. Add cream cheese and onion mixture to chicken and broccoli. Mix well. Add 3/4 cup of the shredded cheese and mix again. Season with salt and pepper to taste. Spread evenly in baking pan. Add remaining 3/4 cup cheese and fried onions on top. Bake for 25-30 minutes until cheese is melted and casserole is bubbling. This is a quick and easy recipe from the “Wheat Belly” cookbook. Prep time: 10 minutes. Total time: 20 minutes. Makes 4 servings (although I would say closer to 3). Total net carbs: 1 per serving. In a shallow bowl or pie plate, combine the pecan meal or ground pecans and the salt. In a separate shallow bowl or pie plate, combine the 2 tablespoons melted butter and the syrup. Dip each cutlet into the butter mixture, evenly coating both sides. Dredge in the pecan mixture, pressing lightly to coat both sides. In a large skillet over medium heat, heat 1 tablespoon butter and the oil until hot. Cook the chicken for 8 minutes, turning once, or until the chicken is no longer pink, and the juices run clear. This is a great crockpot recipe from http://www.thesweetslife.com. I have calculated it at 4 servings and around 4 net carbs per serving. Combine the chicken, onions, celery stalk (1), garlic and broth in slow cooker. Cover and cook on high for 4 hours or on low for 8 hours. Remove the chicken from the pot, reserve 1/2 cup broth and discard the rest. Shred the chicken with two forks, return to the slow cooker with the reserved broth and the hot sauce. Cook on high for an additional 30 minutes (or just keep on warm for another hour or two). Serve chicken on lettuce cups, topped with buffalo chicken, shredded carrots, chopped celery, blue cheese and ranch dressing, if desired. This is my favorite fried chicken recipe! This is a recipe I adapted from George Stella. You can use any chicken pieces that you want for this recipe (I used thighs), as well as any combination of fresh herbs. I added sliced yellow squash to the roasting pan in the last 40 minutes. Net carbs: 1 g.
PREHEAT oven to 350 degrees and spray a roasting pan with nonstick cooking spray. PLACE the chicken pieces evenly throughout the pan and sprinkle all herbs and seasonings over top of each piece. 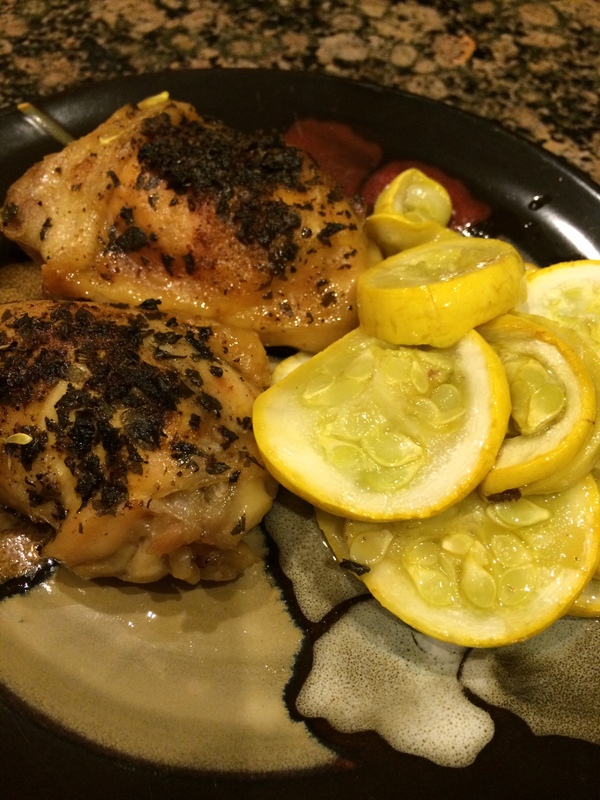 DRIZZLE lemon juice over the chicken and then cover pan with aluminum foil. Bake 1 hour. UNCOVER and baste with the drippings from the pan. Continue baking uncovered 1 additional hour (add yellow squash after cooking 20 minutes). The chicken should be browned and falling off the bones. Optional: serve garnished with additional chopped parsley.